Concerns over vanishing destinations such as the Great Barrier Reef, Antarctica, and the ice cap on Mt. Kilimanjaro have prompted some travel operators and tour agencies to recommend these destinations to consumers before they disappear. This travel trend has been reported as: `disappearing tourism,' `doom tourism,' and most commonly `last chance tourism' where tourists explicitly seek vanishing landscapes or seascapes, and/or disappearing natural and/or social heritage. However, despite this increasing form of travel there has been little examination in the academic literature of last chance tourism phenomenon. This is the first book to empirically examine and evaluate this contemporary tourism development providing a new angle on the effects of global change and pressures of visitation on tourism destinations. It aims to develop the conceptual definition of last chance tourism, examine the ethics surrounding this type of travel, and provide case studies highlighting this form of tourism in different regions, and in different contexts. In particular it critically reviews the advantages of publicizing vulnerable destinations to raise awareness and promote conservation efforts. Conversely, the book draws attention to the issue of attracting more tourists seeking to undergo such experiences before they are gone forever, accelerating the negative impacts. It further examines current trends, discusses escalating challenges, provides management strategies, and highlights future research opportunities. 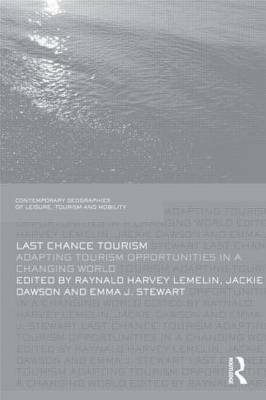 Last Chance Tourism is a timely and multi-disciplinary volume featuring contributions from leading scholars in the fields of leisure, tourism, anthropology, geography, and sociology. It draws on a range of international case studies and will be of interest to students, researchers and academics interested in Tourism, Environmental Studies and Development Studies.